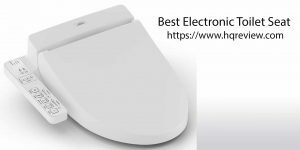 Are you looking for the best electronic toilet seat? Well, you have come to the right place. We can all agree that sitting on a cold toilet seat is annoying especially in the morning. Here’s where the electronic toilet seats come in. They are perfect for early morning toilet visits and winter seasons as they provide much needed warm water. They also come with control system that has many great features. 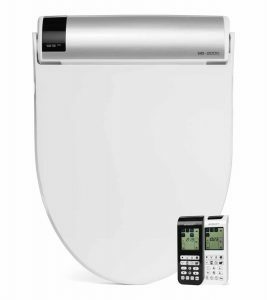 With electronic toilet seat, you can adjust water pressure, temperature and some feature dryer, touch remote control, deodorizer and self-cleaning nozzle. This type of toilet seat is convenient and will make life easier for you. With several brands on the market, finding the right one can be a challenge. 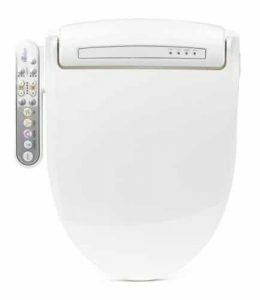 Therefore we have selected top 10 best electronic toilet seats that will offer most favorable performance. Before you purchase an electric toilet seat, there are few factors that you need to consider. Width between mounting holes: Most toilets have a standard width between seat mounting holes, while other are different, make sure you check the width between the mounting holes. Shape: Secondly, you will notice that many older toilets and even some modern ones are round in shape instead of elongated bowls. When making a purchase ensures that the seat matches the shape of your toilet. Lid thickness: It is also important to ensure that the toilet seat and the lid is not too thick; this ensures that there is less risk of the seat slightly overbalancing and closing shut. Materials: Another important factor is the material that the seat is made of. Generally, seats are made from variety of grade plastics or woods. The ones made from plastic sometimes have special treatment that makes them mold/mildew retardant or stain resistant. The wooded ones come in two types, laminated finish and treated solid wood. 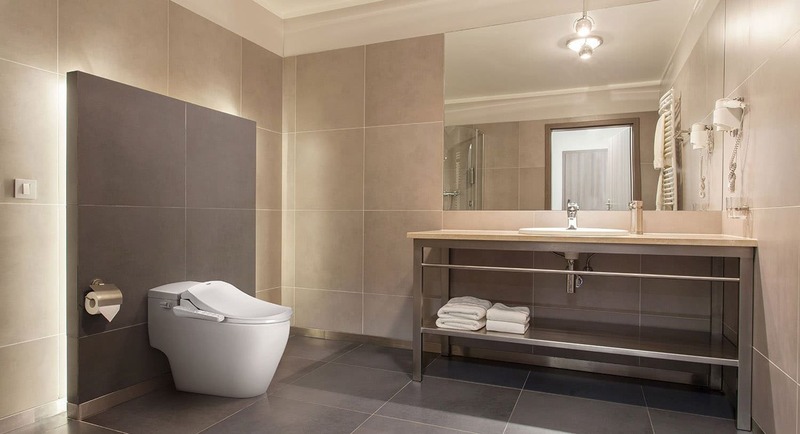 If your bathroom is humid it is wise to choose plastic seat because it is not affected by steam and is easy to clean. Basics of Installing: When it comes to installation, setting up a toilet seat is an easy DIY project. If you face any problem there are some manufacturer who offer 24 hour technical support and friendly customer service, buy from such kind of manufacturers. They are hygienic: Unlike standard toilet seat theses electric ones come with several features such as warm water for posterior and feminine wash that promote hygienic. They are comfortable and luxurious: With this seat you don’t have to suffer cold seat anymore at night or winter season because they are self-heating and provide the much needed warmth. Eco-friendly: These toilet seats are environment friendly since they come with energy saving mode and reduces the use of toilet papers which may litter the environment. 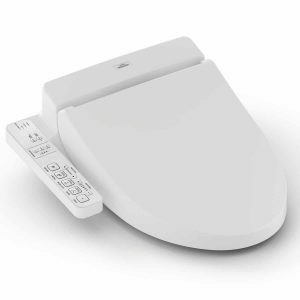 The SmartBidet Electronic toilet seat though slim and sleek in design has an astonishing weight capacity of 440 lbs. It also features a child mode function that automatically sets time routine process for posterior wash and dyer and is easy to use for children aged 5+ years. The nozzle cap is replaceable and offers extended hygienic level so that you stay clean always. This seat matches elongated toilet bowls and comes with a drain button on the left. 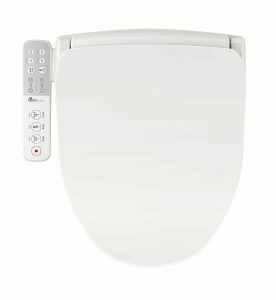 Last but not least, this electric toilet seat features impactful functions such as Feminine and Turbo wash, energy saver, a dryer and water temperature adjustment. All these feature work together to give you a wonderful clean toilet experience. This electronic toilet seat features a stainless steel self-cleaning nozzle that allows easy maintenance and durability. Another interesting thing is it has an in-bowl night light that greatly illuminates the bowl for those simple night toilet visits. Furthermore, it features an improved warm water technology that uses ceramic heating coil to lengthen the duration of warm water supply.Additionally, the heated seat is convenient, cozy and operation is a breeze and it is affordable too. This toilet seat will definitely improve your toilet experience. 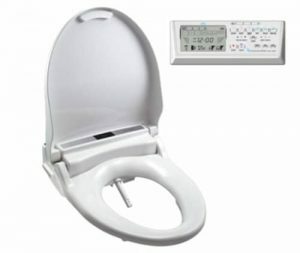 The BioBidet is an electronic toilet seat is a luxurious seat that heavily focuses on hygiene. It comes with 3 in 1 nozzle that offers vortex wash, feminine wash and greatly improves hygiene. The slow closing seat and warm water makes this seat very comfortable. Furthermore, it is eco friendly and greatly cut on toilet paper use and reduces electricity thanks to the energy saving mode. Other luxurious features include, warm heated seat, special turbo wash and lively and oscillating wash options which are all available in simple to use side panel. Lastly, this product comes with a 3 year limited manufacturer’s warranty for parts and labor. 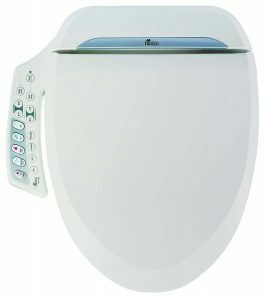 The Clean Sense dib-1500R electronic toilet Seat is one of the best on the market. It boasts numerous luxurious features such as LCD screen, wireless remote control, 4 customable user presets. The sleek design and durability combined with instant water heater that provides endless supply of warm water offers unmatched value. In addition, this seat features a heated seat, temperate air dry, deodorizer, pulse and massage, adjustable nozzle, smart energy save and low noise motor pump. Additionally, the body can be detached for easy cleaning, and it is child user friendly. 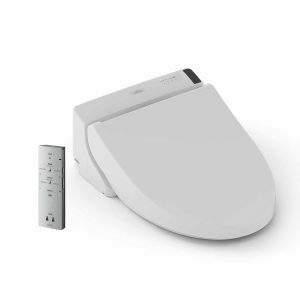 This is another amazing electronic toilet seat from Clean Sense that produces continuous warm water supply. The soft but powerful wash offer added cleansing advantage. With this seat you don’t have to worry about cold seats anymore because it can be heated and stays warm. It also features warm air dryer and carbon air deodorizer. In addition, the lid softly closes down. This seat will definitely offer you the hygiene and comfort you deserve. This TOTO electronic toilet seat deeply cleanses after every toilet use leaving you feeling exceptionally clean. The self-cleaning wand can be adjusted thus allowing you to set the exact temperature and spray type, therefore, provides comfy intimate wash. It features a pre-mist gently sprays mist onto the dry bowl to make the surface a little bit slippery. The 5 settings of water temperature help you control the water warming temperature that is comfortable for you. The air dryer also comes with 5 settings. The air deodorizer is automatically released to mask any unpleasant odors. Furthermore the remote control has back lit buttons for night use and features two user presets. Lastly, this seat allows you to choose a bidet spray in which the pressure of water oscillates hence providing a soothing clean rinse. This great product comes with an exclusive hydro-flush technology and increases the level of personal hygiene .The inside-out nozzle cleaning technology can be considered a game changer, additionally it is not coated or sprayed. During manufacturing, only pure steel is used for the nozzle casing which ensures durability and easy to clean. At the push of a button, the built-in motor frequently extracts and retracts the nozzle while water flows over the nozzle and thus wider angled sprays maximizing hygiene. A 3 year warranty is offered on this lovely product. 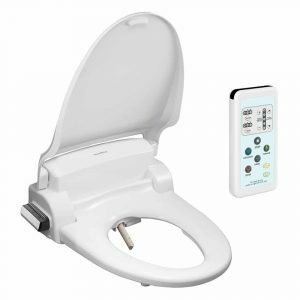 The SmartBidet electronic toilet seat greatly provides hygiene, convenience and comfort. It is also easy to install, use and is environment friendly. 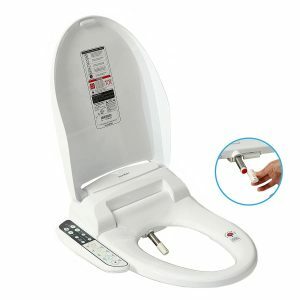 Additionally, it comes with extensive features which include; feminine wash, posterior wash, turbo wash, warm air dryer, adjustable water pressure, heated water and seat, filtered clean water, safety on/ off skin sensor, quick releasing seat for easier cleaning, soft cleaning lid and a self cleaning nozzle. In addition, there are 5 levels of water and pressure settings and 3 levels of heated seat settings. Last but not least, this seat is easy to set up and will fit well on standard elongated toilets. 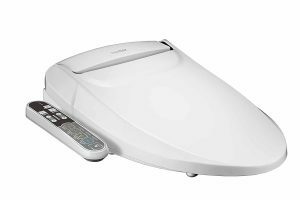 The BIO BIDET BB-600 features a front and back warm water cleansing, anti-bacterial bits and pieces, massage feature that has a wide cleaning function. It works by cycling front and rear streams of water to provide unmatched cleanse. This seat allows you to adjust the water pressure and temperature as well as the position of aerated steam. By just a touch of a button you get to experience hands free warm air dry, comfort and total relaxation. Additionally, it comes with a dual nozzle that provides posterior, feminine wash and is child friendly. Last but not least, it is eco friendly and comes with 2 year limited manufacturer coverage on parts and labor. This amazing product comes with an elongated seat that has temperature control, dryer and deodorizer additionally the water volume and temperature can be adjusted. It has a special oscillating feature with front and rear spray. A convenient arm control panel is also available and the wand is cleaned automatically before and after use. The surface is made slippery by a pre-mist technology to avoid sticking and makes it really easy to clean. We have included the very best electronic toilet seats to help you easily choose the one that is suitable for you. These seats are the future, bringing hygiene to a whole new level in your house or wherever they have been installed. Most of these seats come in white but depending on the manufacturer you choose, different colors are offered so you can match your bathroom. Make the daunting task of toilet cleaning a thing of the past with these automated seats.